To celebrate the end of our fiscal year, Aviat is offering huge discounts on strong security features for Eclipse radios. * This promotion ends June 1, 2019 (PO placed). It applies to software orders only. With Aviat Store, customers can simplify quoting, purchasing, and delivery of Aviat products. Our solution is… CTR 8740! With its state-of-the-art hardware and off the shelf and open source software, CTR 8740 delivers significantly lower cost than standard routers. Anywhere you are, and anytime you need, you will be able to reach an AviatCare support representative. Subscribe to the Aviat MUA and save up to 25% in costs over the 10 year period. Earn Credits! Refer a Friend. Earn $2,000 credit to use in the Aviat Store upon your friend completing a purchase of $5,000 or more. Migrating legacy mobile backhaul networks that were designed for TDM traffic to add support for high-speed Ethernet data for 3G and 4G mobile technologies is one of the biggest challenges for operators worldwide. Each case is unique and poses its own quirks and potential pitfalls. Mobile operators must juggle new technologies, cost pressures and the need to maintain existing services or risk driving customers to the competition. For Safaricom, the leading mobile operator in Kenya and one of largest in all Africa, the case involved preserving its E1 capacity for voice calls and simultaneously adding Ethernet/IP bandwidth for burgeoning 3G and WiMAX data traffic. As many mobile operators have done in the past, Safaricom built its network over time. Many parts of the network are still legacy 2G TDM technology. 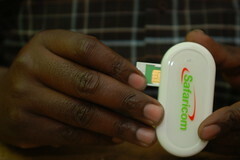 However, things are changing rapidly, with 3G subscriber numbers up 85 percent in 2011 year over year. Many of these subscribers are consuming ever-increasing amounts of data bandwidth. Safaricom’s TDM based backhaul, making use of Ethernet-to-E1 converters, is finding it hard to keep up with demand. To help resolve the situation, the operator called on Aviat Networks, one of its incumbent solution providers. Using its market leading hybrid radio solution, the modular Eclipse microwave networking platform, Aviat Networks enabled Safaricom to add IP data capacity as necessary while keeping E1 capacity for voice calls. I agree that, when migrating mobile legacy backhaul networks, mobile operators need to juggle new technologies, cost pressures and the need to maintain existing services. If these are handled poorly, operators risk driving customers to the competition. My blog post that you mentioned about InfoVista’s recent survey with Billing & OSS World examined these exact challenges, as well as common perceptions of IP/Ethernet mobile backhaul performance. Based on the results, it seems like Carrier Ethernet is very likely to become the most popular choice for next-generation backhaul architectures. I find it surprising that it hasn’t been adopted by the entire industry yet! Aviat Networks, Inc. works to provide dependable communications to our customers. As the world's most trusted expert in wireless transport, and with more than one million systems sold, Aviat provides microwave, millimeter wave, and networking solutions to service provider and private network operators including state/local government, utility, federal government and defense organizations. You can change your cookie settings at any time but if you do, you may lose some functionality on our website.